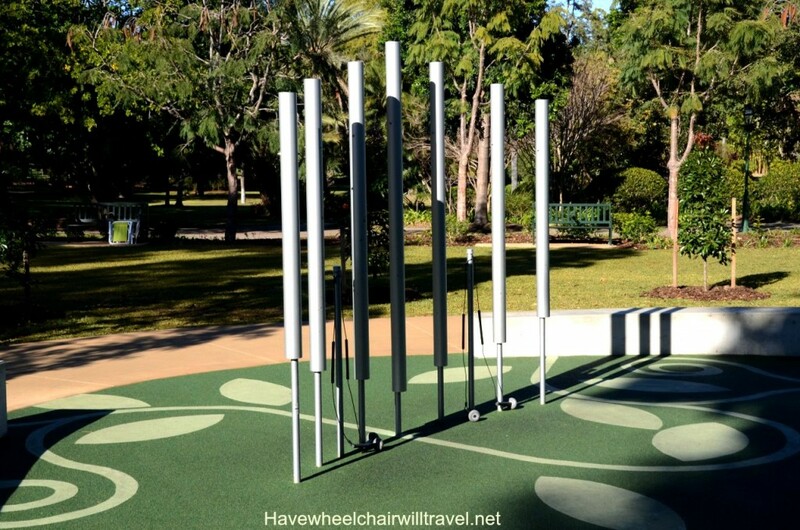 Originally posted Havewheelchairwilltravel on August 2014. It is fantastic to see so many inclusive and accessible playgrounds being built. 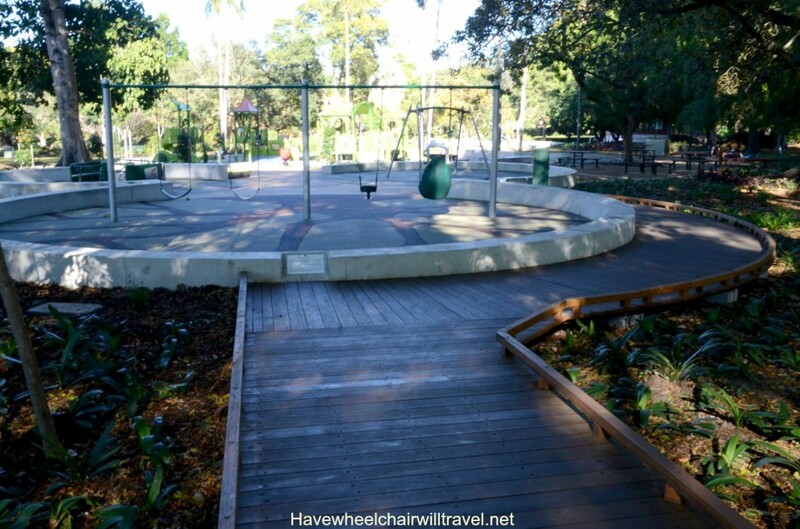 While Hubby was in Brisbane for business I sent him to the recently opened All Abilities Playground in Brisbane Botanic Gardens. He was impressed with the beautiful location and said it is a great place for families to get a break from the busy city. Brisbane City Council describe the park as follows, “the new playground provides access for children in wheelchairs and includes a mix of equipment that is stimulating and interesting for all children. 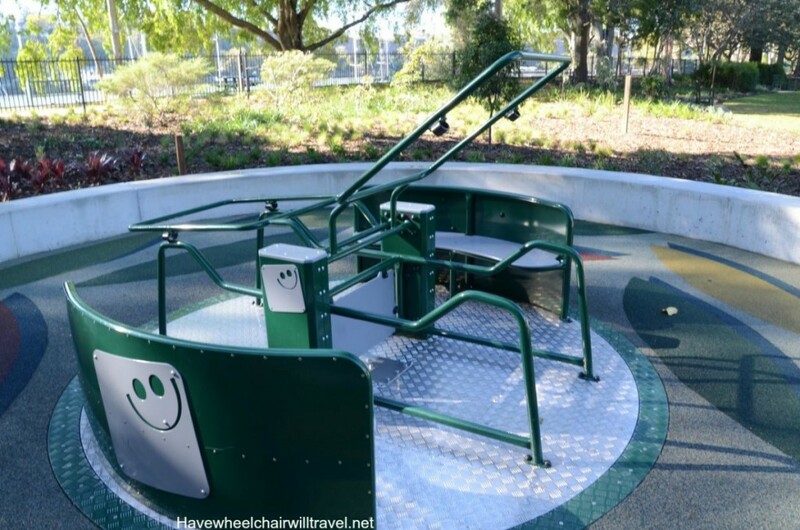 It is supported by additional changes to the park infrastructure, including wider pathways to allow carers to walk alongside wheelchairs and upgraded toilet facilities with ceiling hoist for people with disabilities.” Sounds good? Well take a look at some of the photos. These accessible carousels seem one of the most popular features in accessible parks. They allow a wheelchair easy access (no step up to enter) and two spaces specifically for wheelchairs. Seating allows those that are unsteady on their feet somewhere to sit and also encourages social interaction with peers. A nest swing makes it possible for a child to lie down or have nestswinga parent or sibling support them in the swing. AJ, BJ and myself have all managed to sit in one of these comfortably. Hubby was impressed that this digger in the sandpit was positioned at the edge of the soft fall meaning that a child in a wheelchair can use it without needing to go in the sand. 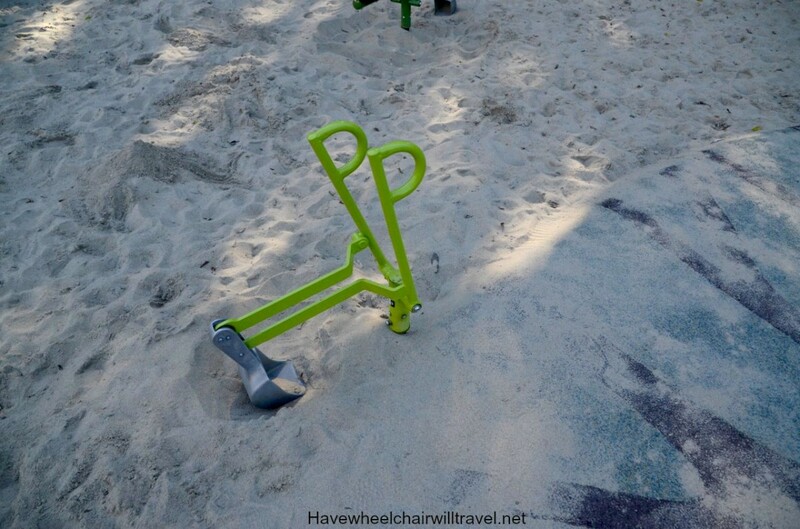 Sand and wheelchairs don’t mix generally. 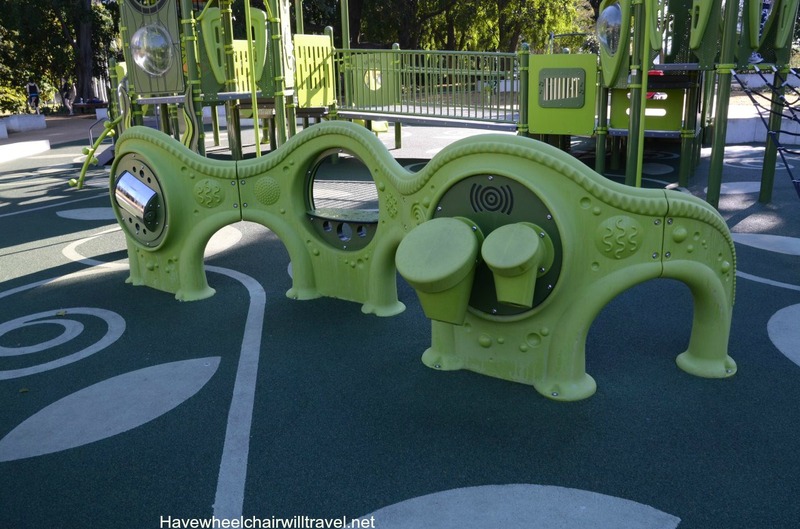 Sensory panels are positioned around the park allowing for play in a wheelchair. I can imagine BJ loving a turn on the bongo drums. Communication boards are a fantastic addition to parks. I love the fact that many accessible parks are installing these boards allowing for spontaneous communication for children who are non-verbal. It also provides a fun environment to practice newly learnt skills for a child in the early stages of using a communication system. 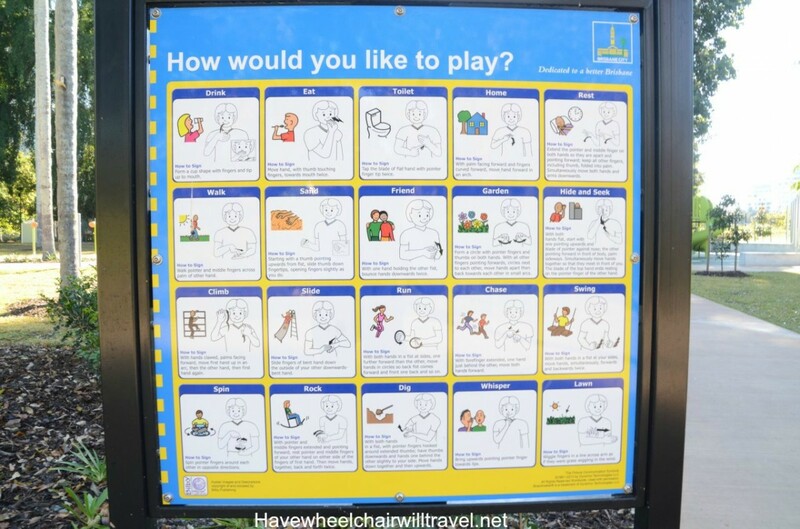 For children visiting a park who do not have a disability it opens up the opportunity for a conversation between children and their parents, hopefully resulting in educating everyone that people communicate in different ways. I think it would be great if these boards came with a short explanation at the top describing how these boards help people communicate. It would assist parents in giving their children an informed answer to their ‘why’ questions. Large musical pipes look like lots of fun. There is no Liberty Swing (wheelchair swing) at this park. There is a harnessed swing for those that can get out of their wheelchair. These do provide more support than a general swing but I personally feel the Liberty Swing still has a place in playgrounds. 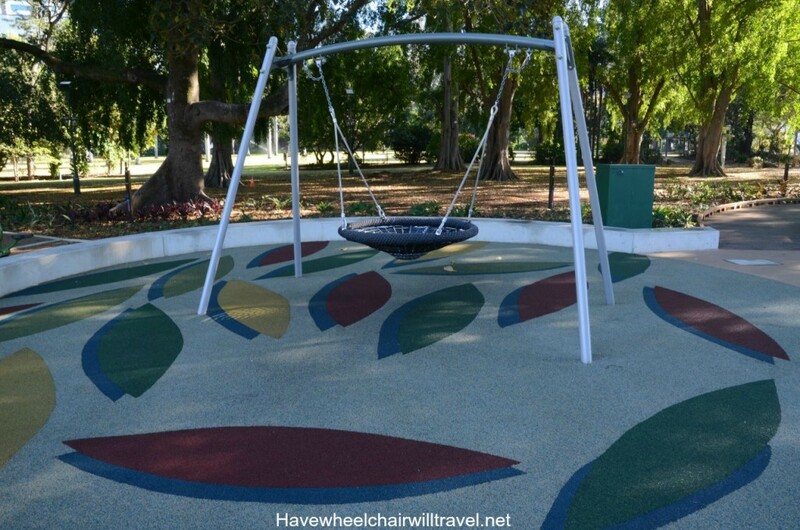 Children or teens who cannot get out of their wheelchairs can’t use the nest or harnessed swings. I love the sensation of swinging and I don’t think much replaces that liberating feeling. Just my opinion and I know many disagree. 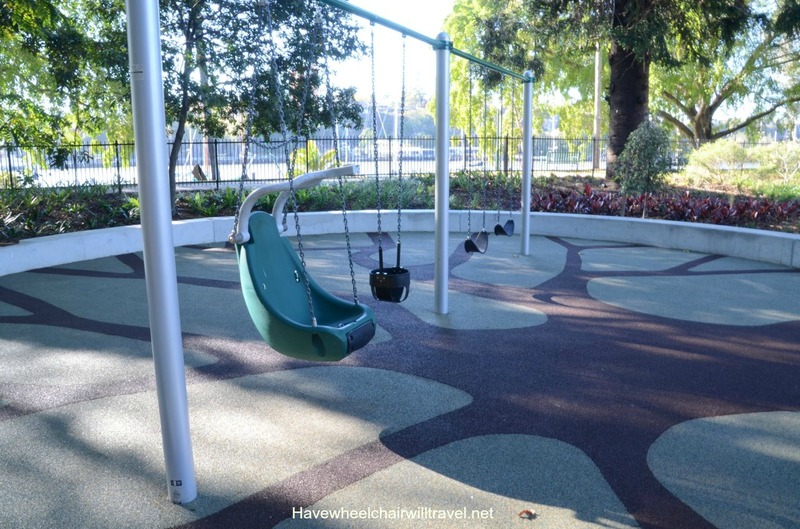 Hubby was very impressed with the paths that surrounded the playground and the overall location of the park is lovely. 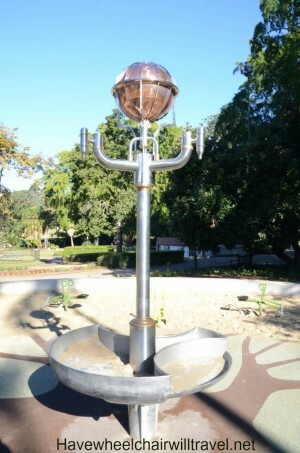 I hope one day to get to the park myself to check it out with the kids. The playground is located in City Botanic Gardens, Albert Street, Brisbane. For more information head to the Brisbane City Council’s Website.